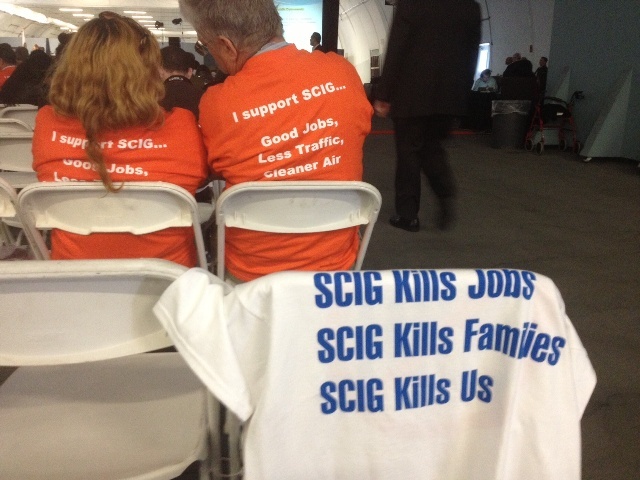 In what was undoubtedly a divisive decision, the Board of Harbor Commissioners with the Port of Los Angeles (POLA) unanimously voted to support the building of a controversial $500 million rail yard named the South California International Gateway (SCIG) to be managed by rail giant BNSF, sending the Long Beach-affecting project off to the L.A. City Council for final approval. According to supporters of the project, SCIG will not only be environmentally sound–Chairman and CEO of BNSF, Matthew Rose, called it “the cleanest rail facility in history”–but also talked of the importance the project is in order to maintain competition, specifically with the Panama Canal. Opponents, including Long Beach Mayor Bob Foster, say that the proposed rail yard will be highly detrimental to West Long Beach residents due to air and sound pollution caused by increased traffic. “Expanding near-dock rail service sharpens the competitive edge that makes the Port of Los Angeles a global leader in international goods movement,” said Los Angeles Board of Harbor Commission President Cindy Miscikowski in response to detractors, noting that the requirement of low-emissions vehicles would ensure its cleanliness. “Los Angeles” is one of the key terms in regards to the opposition since Long Beach residents–not those of Los Angeles or Carson–will be affected the deepest according to groups who have studied to FEIR. This explains the vitriol in the comments from both Foster and 7th District Councilmember James Johnson, as well as a plethora of community and health groups who spoke during the seven-hour meeting Thursday. Video courtesy of Marlene Alvarado. According to the opposition, the final Environmental Impact Report (FEIR)–though POLA entered new information regarding the carcinogencity of diesel exhaust as well as the fact that ultrafine particles are toxic–still remained filled with multiple errors and misleading information. One of the most disturbing points, according to researchers, revolves around transloading. This concept, originally pointed out by Streetsblog in October, involves the moving of three 40-foot international container goods into two 53-foot domestic containers to save money. Those containers, despite holding international goods, are now deemed domestic and therefore must go to a domestic yard–in this case, Hobart, since BNSF claims SCIG will handle only international containers. Given the rise in transloading at POLA, many fear that contrary to the claim that less trucks will be on the 710, more will use the transport pathway from SCIG to Hobart due to transloading. Paranoia also arose since Hobart has a slated expansion project, which many felt insinuates BNSF knows transloading will continue to increase. Furthermore, opposers are unimpressed with efforts to buffer the neighborhoods surrounding the project in West Long Beach.